25.0% to their lowest level since 2003." "In 2009, the United States represented 63.0% of Canada's total merchandise trade (exports and imports combined), down from 65.7% in 2008 and 71.1% in 2005. Exports to the United States declined 28.2% to $269.5 billion, led by falling prices of energy products and lower demand for automotive products." 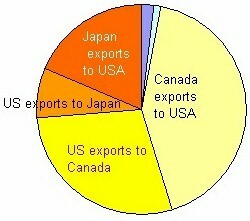 Destinations due to the very large number for exports to the USA, a graphical representation looks poor because the UK, China, Japan and Mexico figures are collapsed at the bottom. Below is a rendition easier to view. 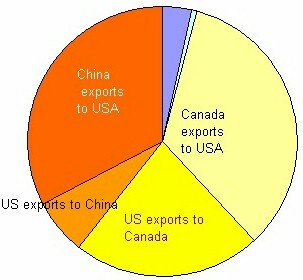 Canadian imports from the U.S.